#ArtvsArtist. Have you heard of this tag? If you haven’t its one of those “tag your it” type of games that are common on Instagram. This one asks you to show yourself with some of your favorite photos. It’s a chance for your followers to see the person behind the images. For those of you who have been on IG for more than a few years, you know this is not the first time this tag (or something similar) has flowed through the toy photography community. In fact the energy and excitement that this tag elicits, at least for me, took me back to the early days of IG. In fact it was through a similar tag that I first meet Bricksailboat and Dinoczars. These are the first two people I met from in person that I had previously only known on Instagram. It was this meeting that eventually led to our annual toy photography meet-ups. So as you can see, I have a fondness for this type of tag. They can led to amazing places! 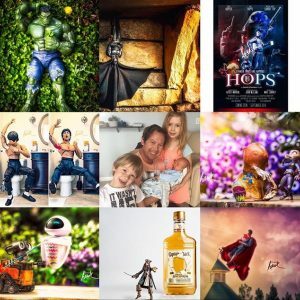 Fast forward five years and there’s a whole new group of toy photographers creating their #ArtvsArtist images. I’ve seen both new faces and familiar favorites. I’ve even discovered quite a few new accounts to follow. Two comments I saw several times while enjoying the hashtag took me aback and I want to address them here. The first is the common refrain of “I’m not an artist”. The second is “I don’t see the point in doing this”. Lets tackle this first statement: I’m not an artist. I can understand why many people would shy away from this word. Such a simply word is weighed down by a whole lot of unnecessary baggage. Let me try to put it in perspective for you. Art is all a matter of personality. So if you’re a creating photos, which are a visual art, AND you define art at as matter of personality, then I think we can safely say that toy photography is art. To me this is the most frustrating comment of all. What’s the point? It seems pretty self-evident to me that art isn’t made in a vacuum. Art is about engaging with the viewer. Creating successful art is also about creating a connection with the viewer. I want to see the person creating the work I look at everyday. From the enthusiastic reaction to this tag, I don’t think I’m alone. One of the reasons I like to show my work at outdoor arts festivals and brick conventions is a chance to meet people. I enjoy stepping out from behind my work and connecting with people in a very direct way. There is little opportunity to do that on a social media platform. So a tag like #ArtvsArtist gives me a chance to see the people behind some of my favorite accounts. This simple ‘reveal’ brings us one step closer to a real connection. And dare I say a friendship? Looking though my feed and the tag in general I learned that a LOT of people identify as artists. Creative people as diverse as tattoo artists to cake decorators all self identify as artists. So if they can, so can you. I’m gratified that see more women stepping into this hobby than I’ve seen in the past. When FourBricksTall finally showed us her lovely face, one commenter remarked “I thought you were a man”. This is a good reason not to make assumptions about the people you’re following. Or maybe that we need to do this more often. Another discover I made was that James (Harri.Hawk) recently welcomed a new addition to his family. Congratulations James! I feel privileged that members of our community feel comfortable sharing a little bit of their personal lives. It is these moments that bring humanity to the impersonal nature of social media. As Instagram continues to mess with the platform to make money its nice to be reminded of what Instagram used to feel like, if only for a few minutes. It was often just fun to see the faces behind some of your favorite accounts like Spidygoeshygge. You just never know who you’re going to meet when they pull back the curtain. I think that has been the aspect of this hashtag blitz: the reveal. I really have enjoyed this tag an I appreciate everyone who took the time to play along. Many of your posts I will never see because of Instagram’s algorithm. Searching the tag is nearly useless for finding toy photographers since there are artists of all genres using it already. I even looked to see if you can search with multiple hash tags, but no luck. For a moment it felt like the old Instagram. There was an energy and excitement to see who would reveal themselves next. SO why this energy has dissipated, it was certainly fun while it lasted. While the energy didn’t last long I hope my fellow toy photographers learned to proudly identify themselves as artists. And while this hashtag madness may seem like another silly tag to join in on, it’s moments like this that can break through the anonymity of social media and bring us a step closer to real connection. And thats a good thing! If you have not participated I encourage you to do so. If you think I missed your #ArtvsArtist post, please feel free to tag me. I enjoy seeing the happy artist surrounded by the work they’re most proud of. You can keep the good vibes going by joining our G+ Community. Think of like the bar or clubhouse down the street where everyone knows your name. 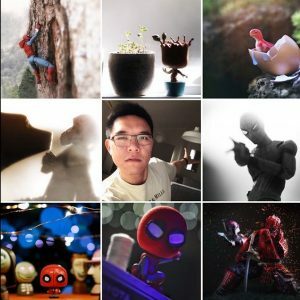 I too LOVED this round of #artvsartist, and I wonder if we can convince all the toy photographers to add “#toyartvsartist” to their posts to subcategorize ourselves a bit for better visibility in our particular community? I can understand why toy photographers, or even photographers in general, don’t want to consider themselves artists. I had a very hard time adopting that label for myself. For most of my life I had the perception that artists were really and truly special. Artists are the master of their various forms. I mean, think about the visual artists everyone knows. Da Vinci, Michelangelo, Van Gogh, Rembrandt, Normal Rockwell. All masters of the craft. Musical artists are the ones that played on MTV. Even sports people at the top of their game are sometimes given that moniker: “He handles the ball like an artist”. So artist becomes synonymous with being amazingly creative and talented people at the top of their games. If one holds to that definition, it is the height of hubris to refer to myself, a chump hiding in a basement shooting LEGO, as an artist. I didn’t have the gumption to refer to myself in the same league as Da Vinci. However over time I’ve come to realize that definition is not true – as you outline in this post. Being an artist just means being creative and speaking my vision. Calling myself an artist doesn’t inherently mean I am claiming to be any good at what I do, just that I do it. Nice reply Dave. I like how your own definition has grown as you’ve become more aware of your own artistic journey. I think the word ‘artist’ is imbued with different meanings for different people. Weather you’re a great artist, a digital artist or simply a creative – the process should be respected and the name worn proudly. I let others define the value to the word. It is not for me to decide if I’m great or not. But like you, I’m creating, and that is enough to call myself an artist. Keep on being awesome Dave! I really enjoyed this tag. It was great fun to check IG every day and see everyone’s selfies. I rarely ever post (or even take) a photo of myself, so I was a little nervous about posting this one but I’m glad I did 🙂 Like you said, I think it’s helpful when we can associate a face with everyone’s wonderful images! It feels more personal that way! P.S. That’s a great idea Leila! It does feel more personal!! I hope we can find more ways to connect and shorten the divide between us. Social media can be so lovely and lonely at the same time. For a moment we fell on the right side. I see there are a few people using #toyartvsartist. Maybe we can get people to retroactively Tag their photos? This tag was fun. When I first was tagged I wasn’t sure if I wanted to do it or not. I did because I wanted to tag other people and see their stuff more than put my mug in the middle of some of my photos, but I couldn’t do that without first doing it myself. I am a social person and that, in part, drives my toy photography, because I like being part of the toy community- both on G+ and IG. I have met a great many people through tags and have always been a huge fan of using diverse hashtags on my IG posts. Local tags have allowed me to follow other local photographers and opportunities to meet some of them (I have been invited to photos walks but not done one yet). Tagging something like #LOTR has got me some friends and fans that are also into that fandom. So there is a lot of value in tags as long an Instagram behaves and allows them to work properly (sigh). Let me be the first to say that I have struggled with labeling myself as an artist. Ive always fallen back on the less baggage prod lane: photographer. But at this point in my life I dont care what others think. I really feel that after 50 I can be whatever I want to be. I may or may not be good, that is not what this is about. But if I want to call myself an artist, photographer or creative, these are labels I choose for myself. And what is with the IG drama? You must travel in some pretty viscous circles. I dont see that attitude in the Lego corner. Maybe its there and I simply dont see it. But I fail to see why anyone gets worked up about toy photography – its not brain surgery. I consider what we create art. To me that does not imply any kind of gravitas, as it’s well known that the world is full of good and bad art. It’s a label that encompasses so much. And although I have no problem with identifying as an artist, because at its root that’s what we are, I am more inclined to refer to myself as simply a toy photographer. I like the specificity of it. I think other kinds of artists may feel this as well, which is why we have glass artists, ceramic artists, recording artists, voice over artists, tattoo artists, etc. Thanks fo rejoins the conversation Mitchel! Why agree with you on one hand – we are toy photographers. When I’m talking to a gallery owner I cant use that phrase; it undersells what we do too much. When you combine toys (aimed at children) with photography (everyone claims they’re one these days) you’re doing yourself a disservice. As you so rightly point out, there are both good and bad artists. Im not saying I’m a good artist, juts an artist. If it’s what you do, say it loud and proud! Great point about galleries, Shelley! But I disagree that calling yourself a toy photographer does a disservice to you. In fact, when I talk to toy and entertainment companies, ‘artist’ would not not do justice to what I bring to the table. In fact, calling myself an artist in those environments would potentially be a red flag to them. 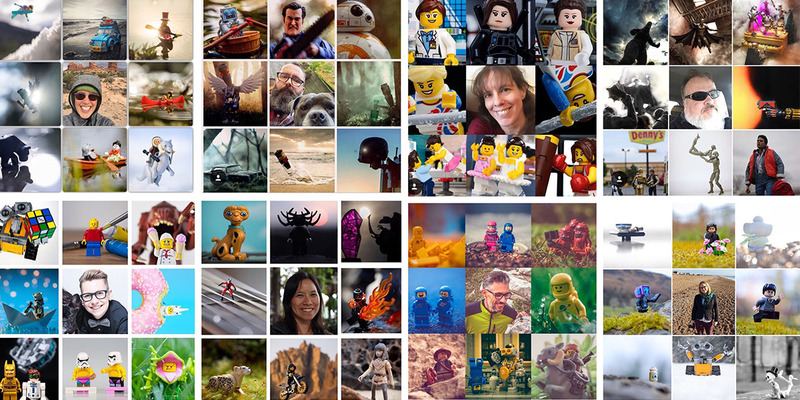 I go with toy photographer – because it says this is what I do, and what I focus my career on and specialize in. So yes, pick your poison based on what serves you best, but ultimately I think we can agree that the work is what will or won’t get you in the door. As far as Jason’s comment about drama on IG, I’m with you in that I often hear about it but rarely see it. But then I don’t follow a gazillion people so that may have something to do with it. What I have seen on IG are grown men throwing public tantrums because they don’t feel like they’re getting the love, respect, followers or whatever they feel they deserve on IG. Humorous as that may be to see, I think throwing tantrums may not be the best way to gain followers and respect. Jokes aside, it is a great and timely post with the momentum of the hashtag. Personally (and I’ve mentioned it a couple of times,) I’m a supporter of building communities as being connected is important, fun and healthy. The hashtag had some fun reveals and yes, I do agree the “veil” gets lifted and a facade gets pealed back. However, I can imagine there is a certain sense of vulnerability with showing our face – would others judge how we look/our claim as being artists/etc? Trust and vulnerability goes hand in hand in any relationship and I’m willing to risk it with the toy community. I would shamelessly claim to be a photographer and artist, albeit an un-famed and un-paid one with dreams. I like the Marcel Duchamp quote and I do see art as an expression of my personality. I almost held back from this as I didn’t want to get caught up in those (in my mind) ridiculous ‘post a photo a day and tag three friends’ chains. However, I looked at what people were doing with the hashtag and saw something so much more. People were letting me into a little of their lives and I felt I should do the same. Of course, I had to be a show pony about it and set up a shot among my toys! I wasn’t an Instagram user, till I found this hashtag. I wish that Instagram was more about memes like this, than “showing butts, and faking how fit you are”.